Thomas Dunne Books, 9781250006868, 432pp. Alfonso "Little Al" D'Arco, the former acting boss of the Luchese crime family, was the highest-ranking mobster to ever turn government witness when he flipped in 1991. His decision to flip prompted many others to make the same choice, including John Gotti's top aide, Salvatore "Sammy the Bull" Gravano, and his testimony sent more than fifty mobsters to prison. In Mob Boss, award-winning news reporters Jerry Capeci and Tom Robbins team up for this unparalleled account of D'Arco's life and the New York mob scene that he embraced for four decades. 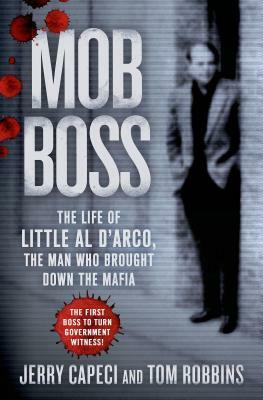 Until the day he switched sides, D'Arco lived and breathed the old-school gangster lessons he learned growing up in Brooklyn and fine-tuned on the mean streets of Little Italy. But when he learned he was marked to be whacked, D'Arco quit the mob. His defection decimated his crime family and opened a window on mob secrets going back a hundred years. After speaking with D'Arco, the authors reveal unprecedented insights, exposing shocking secrets and troublesome truths about a city where a famous pizza parlor doubled as a Mafia center for multi-million-dollar heroin deals, where hit men carried out murders dressed as women, and where kidnapping a celebrity newsman's son was deemed appropriate revenge for the father's satirical novel. Capeci and Robbins spent hundreds of hours in conversation with D'Arco, and exhausted many hours more fleshing out his stories in this riveting narrative that takes readers behind the famous witness testimony for a comprehensive look at the Mafia in New York City. JERRY CAPECI is a New York-based news reporter, columnist, author and recognized expert on the American Mafia. He has written six true-crime mob books and has penned a weekly online column about the Mafia, ganglandnews.com, since 1996. TOM ROBBINS has covered crime and politics in New York for more than thirty years as a reporter and columnist for the New York Daily News, New York Observer, and Village Voice. He is the co-author of Mob Boss. He now teaches investigative reporting at the CUNY Graduate School of Journalism.